Our 1 year anniversary just passed as we first came across our fixer upper home. While browsing last year at some homes we came across a very neglected foreclosure home that had two things that caught our attention, the wooded backyard and basement (watch our before video and post here). With the high priced homes in our home state of NJ we felt this was our opportunity to take a home that had the right location but needed some work and make it our dream home. 7 months of renovation later and I am finally getting to share one of the main rooms in our home that was a true work of love. 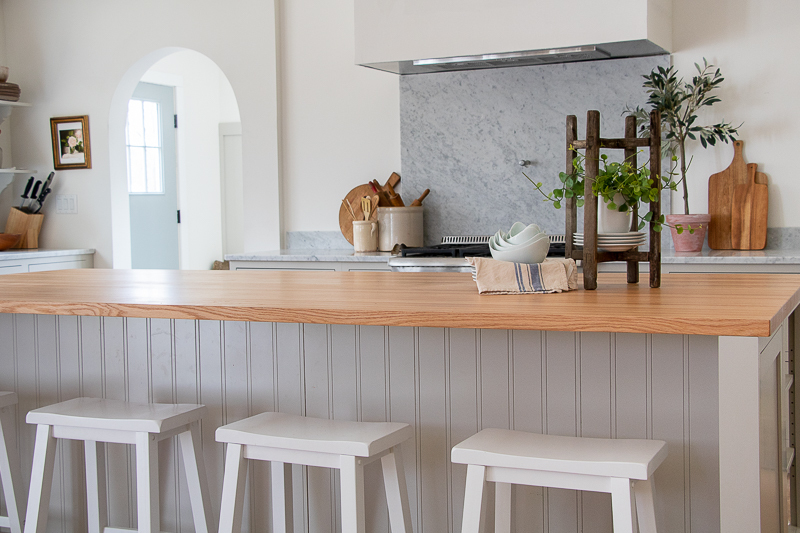 It was around last spring when I started looking into kitchen designs that I envisioned for our dream home. One, it had to be all open and 2 it had to feel like a European Farmhouse style space (read more here about our Kitchen plans). I wanted clean lines, open floor plan, and luxury style appliances. I always think when it comes to my designing that it’s very similar to my appetite, my eyes are bigger then my stomach or in this case my budget. 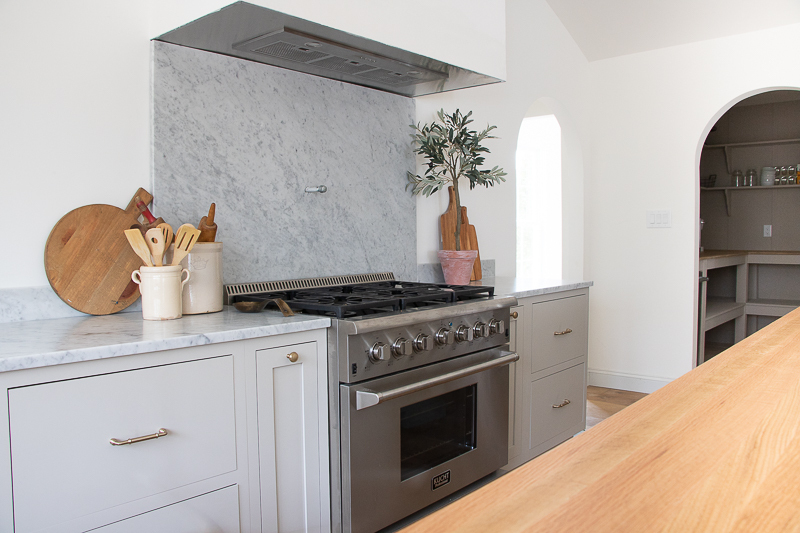 I browsed luxury kitchens and found sleek appliances that felt right out of a chef’s kitchen that blended beautifully with the style of the kitchens. I wanted the same look for my home, but I knew browsing high end appliances was not going to be working for our construction budget. 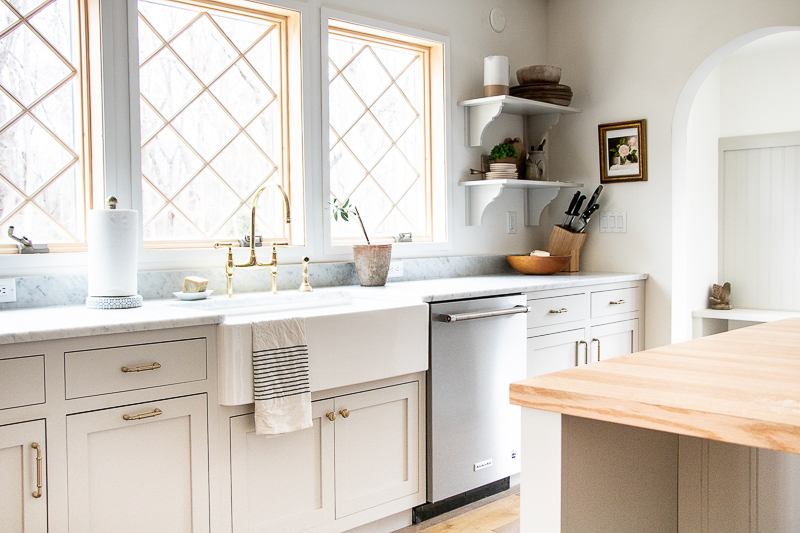 After browsing one day at my local Home Depot during the very beginning of our design stages…I stopped with my kids to browse the beautiful Kitchen Aid appliances that they had right there in the appliance department. 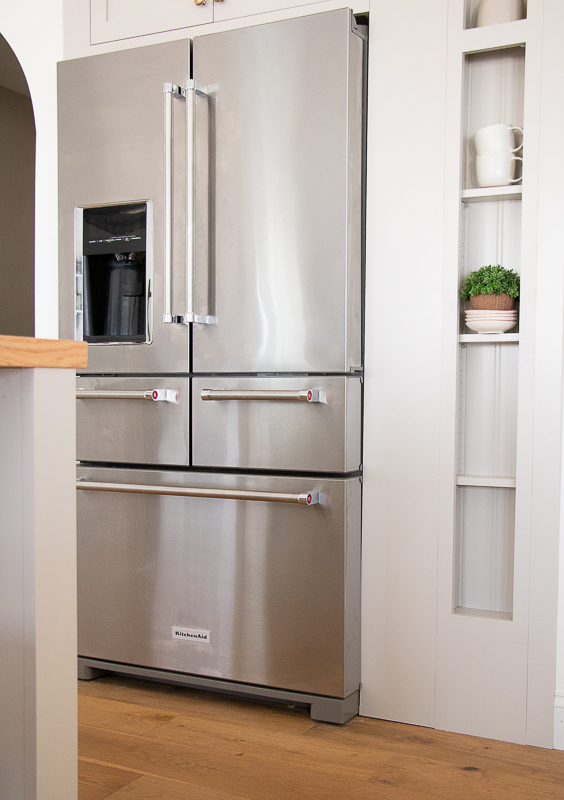 I instantly fell for the sleek door style that the Kitchen Aid offered in the refrigerator style and loved how the compartments and the overall style and size of the fridge. All appliance links listed at bottom of page for convenience. This is a collaborative post with Home Depot. All photos and opinions are my own. This brought me to the Home Depot’s website. I wanted to know more and see more all about this KitchenAid line. 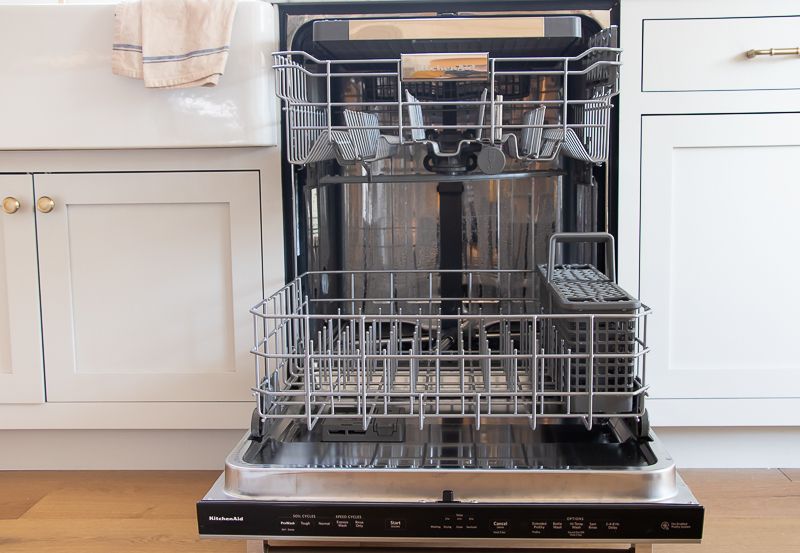 The reviews were fabulous, and each appliance features and style were absolutely beautiful. I think another detail that appealed to me was the stainless color. 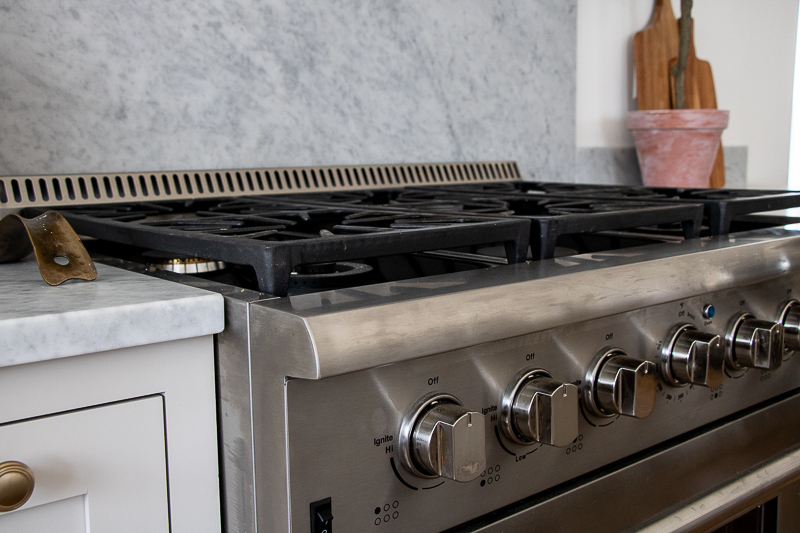 I learned very early that certain stainless finishes are different and that some companies match others but it was something to keep in mind especially if mixing your appliances. 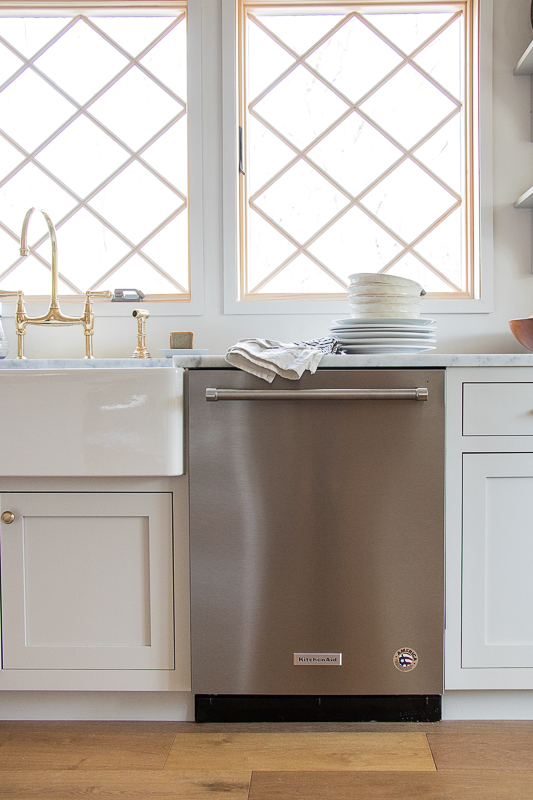 All of this was very new to me as I had only once shopped for a new range in our last home, but never had the opportunity to really shop for appliances. It’s definitely something important to note if you are shopping for multiple appliances or shopping for appliances to match your existing ones. 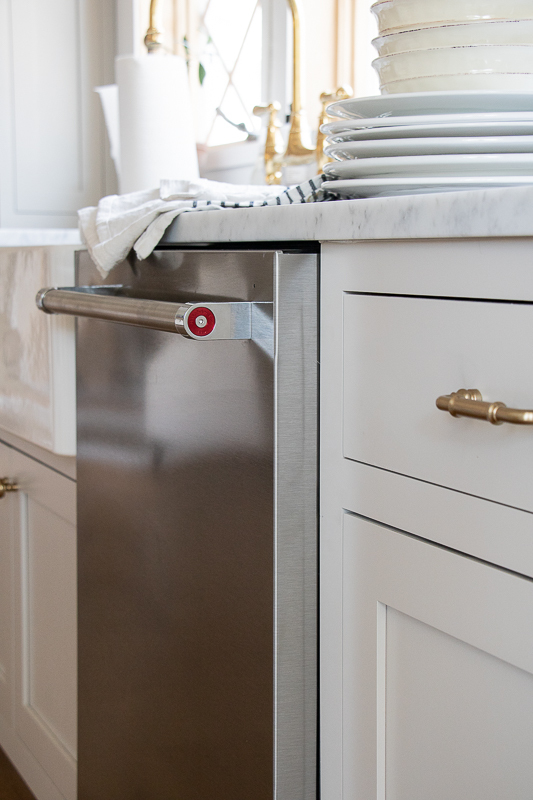 So, that of course not only appealed to me was the really high end look of the stainless on the Kitchen Aid refrigerator and dishwasher, etc…but the handle totally wooed me! If you haven’t seen a Kitchen Aid handle yet…be prepared to fall hard. The chef style handle with that little red detail just spoke luxury and style. Now, style of course is always the first thing I look at and I’m not afraid to admit that. I am a very visual person and that’s why I love interior design so much. After style of course then it has to be functional for our family. So, once I decided on the style I wanted to make sure that the function was going to work. First the refrigerator since this was the most important at least to me. We planned for the refrigerator to be on it’s own wall tucked into the pantry surrounded by a top cabinet and a petite bookcase. 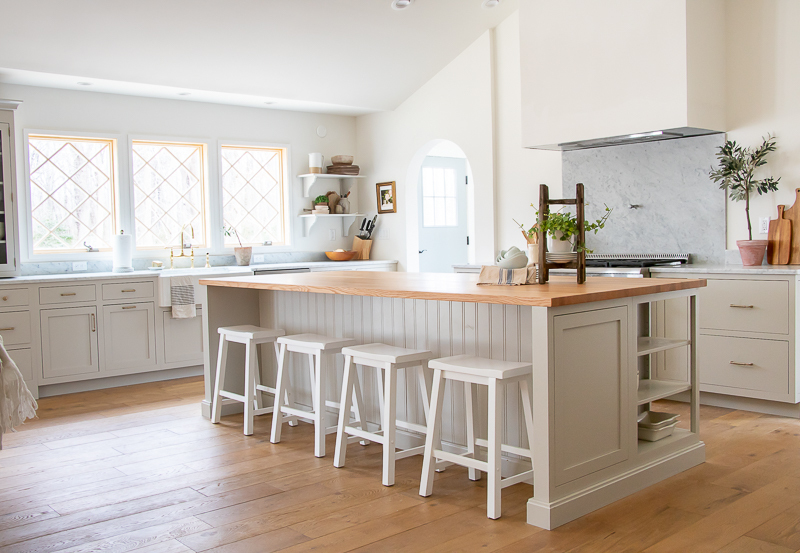 It saved us room in the design of our kitchen by having it tucked into the wall and I have to give props to my hubby for making that design decision (he’s learned so well). So, since this was going to be a focal point I needed to make sure the style was important, but also to make sure the function would work for our family of 4. I had planned for a french door style refrigerator with a bottom freezer drawer. I felt this would make unloading groceries easier and I had heard good things about having this layout for a refrigerator. 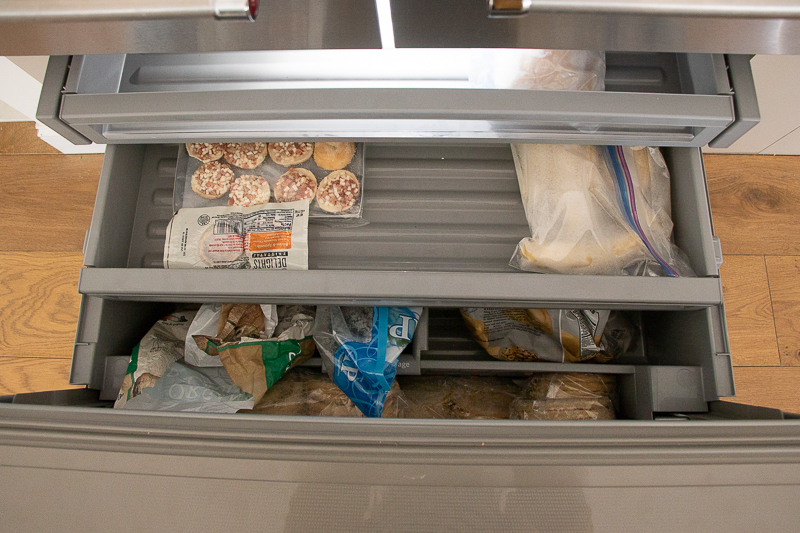 The separate drawer fronts were another great feature that I loved to keep my refrigerator organized (coming from someone who is not too organized) but keeping produce and cold cuts in the drawers, making it easy to access and keeping each product in it’s own designated space. 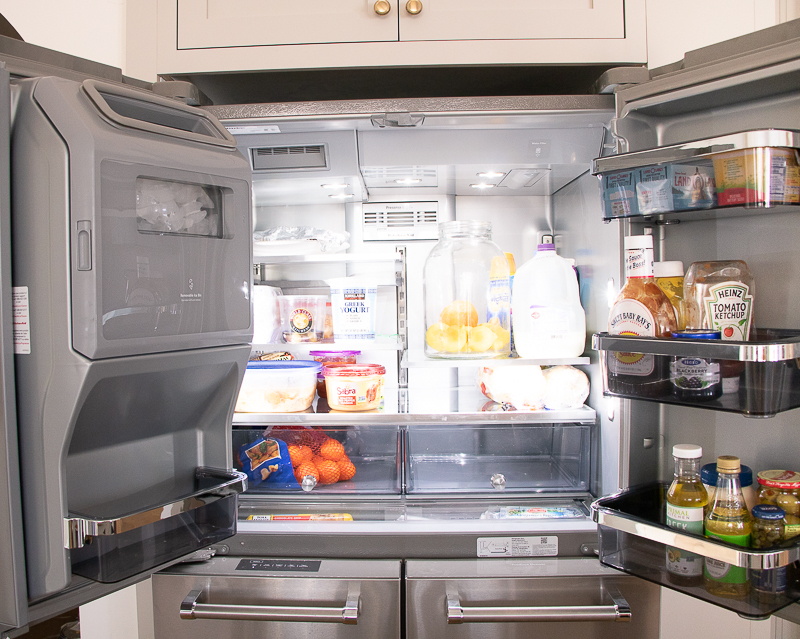 The lights in the fridge make for a bright and lit up view, my husband calls in a spaceship interior…a true compliment to the designer of this fridge. The dishwasher another beauty and I wanted to be sure to select this particular model, to have that matching KitchenAid handle. The 3 tiered shelves make for extra space when washing. 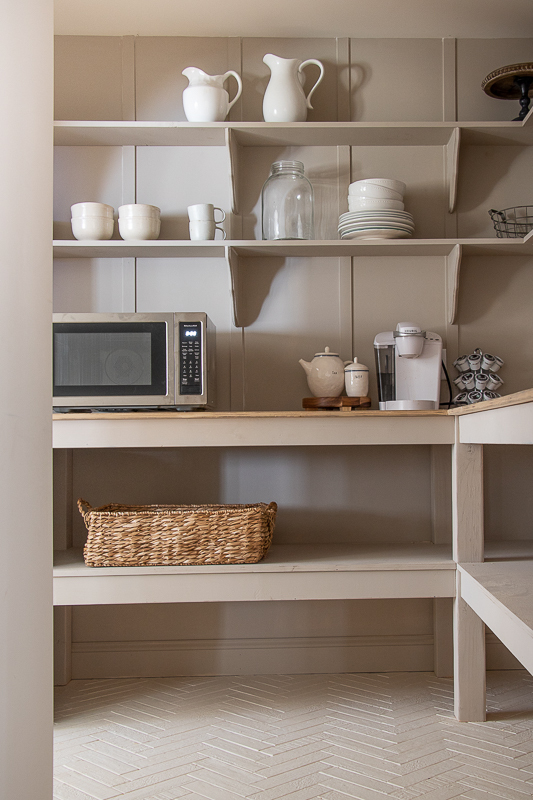 We love having that top drawer to add items like cutting boards, large spoons, and spatulas. A great way to add more to make the most of the cleaning. I have to also rave about how quiet this machine is. Having the extended pro dry is awwwesome! I love that I don’t need to grab a dishtowel before putting away. I haven’t tried the sanitize option yet, but I LOVE that it offers this feature. Okay, let’s now talk about my range because that too was a focal point of the room. 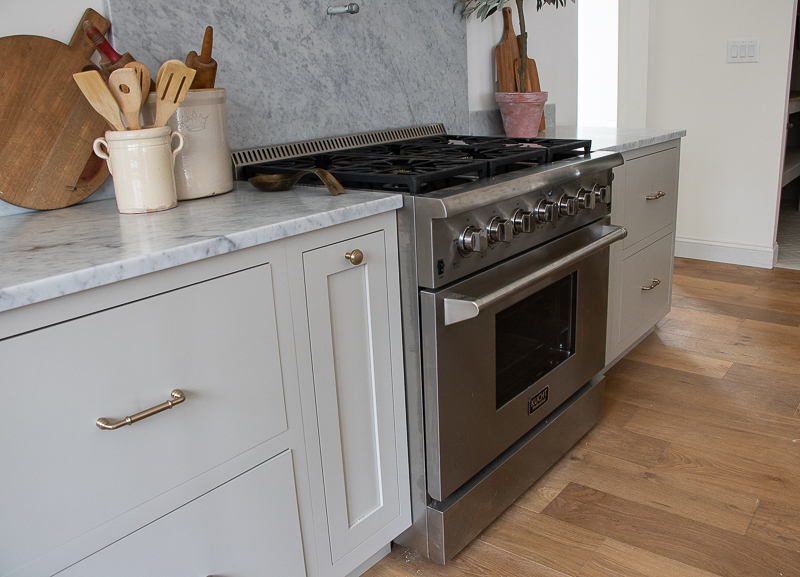 I decided to switch up my range here because I needed a 36″ size and I loved the Kucht range when browsing the Homedepot.com It had a very similar door handle which I felt would help keep the appliances matching, and the stainless is a very similar color. The range was gorgeous online but the day it arrived here my jaw seriously dropped. The industrial style just really worked with this European Chef style feel I was going for and it also had clean lines and a sleek look. The 6 burner was of course a bonus as it wasn’t a must on my list but I can say I am so excited that it offers this feature. I totally take advantage of having that 6th burner too. 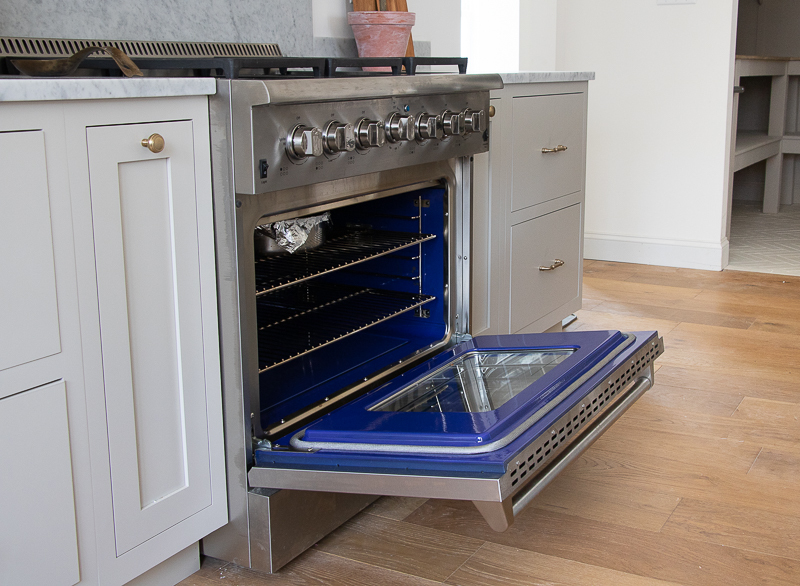 Then you open up to the beautiful blue interior oven that never gets old opening and shutting. I have to add that I’ve never boiled water so fast either. Having such a chef style range really makes cooking easier and I think it may have sparked my interest in cooking more too. It’s amazing that having the right tools help make cooking in this kitchen so much easier and more exciting. We also selected a range hood from Home Depot. This was our first hood vent as we are use to having a microwave that’s above the range. When designing the hood I wanted something super sleek. I wanted it dramatic but I also wanted it to be clean and simple. So we decided to keep it as a drywall hood. We do plan on framing the bottom with some wood keeping it painted same color as walls, but as you all know a home takes a while to become a home. There are always little add on projects. The microwave we decided to add to our walk in pantry. We just had this all built with lumber bought at Home Depot and built by a local company @distinctivecraftworks. 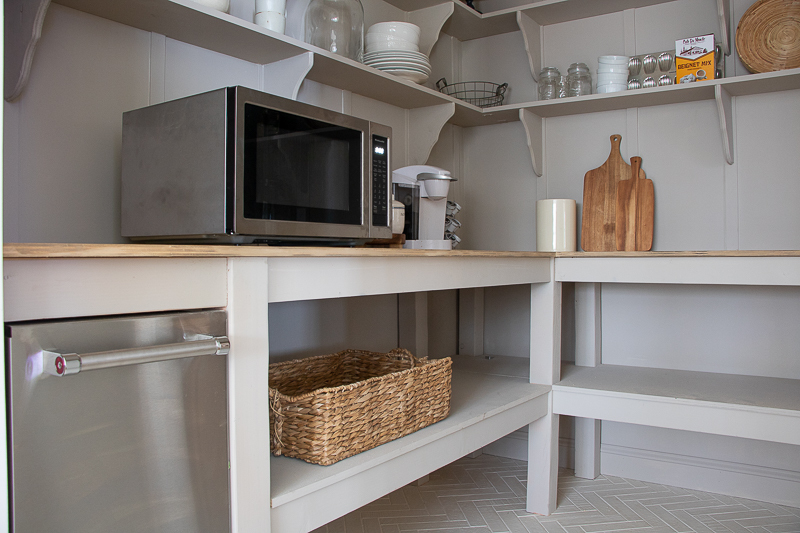 This made this space functional and gave my microwave a resting place since I wanted it to be hidden but easy to use. It also blends beautifully in this space with the Kitchen Aid ice machine. 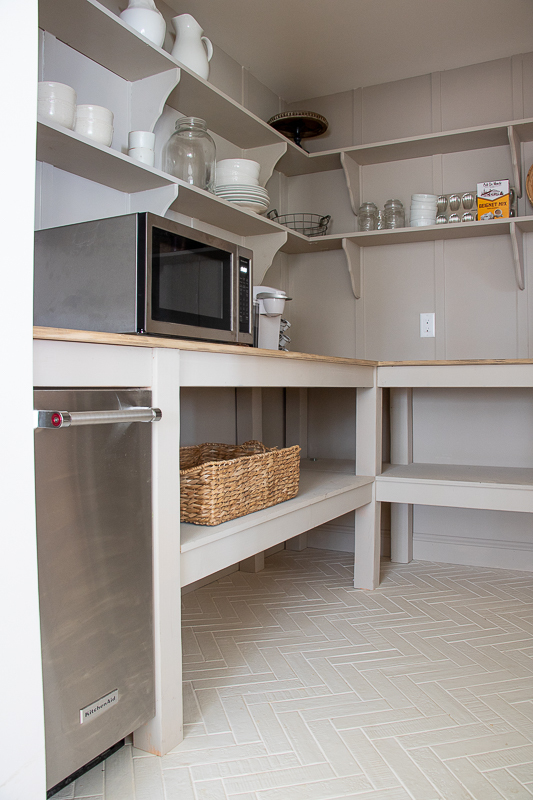 We loved the idea of having both pieces in the open pantry as it’s open to the dining space and the kitchen. The stainless just pops beautifully from the taupe walls. The microwave is also super quiet which I love and the ice machine is going to make our home the perfect spot to host more. 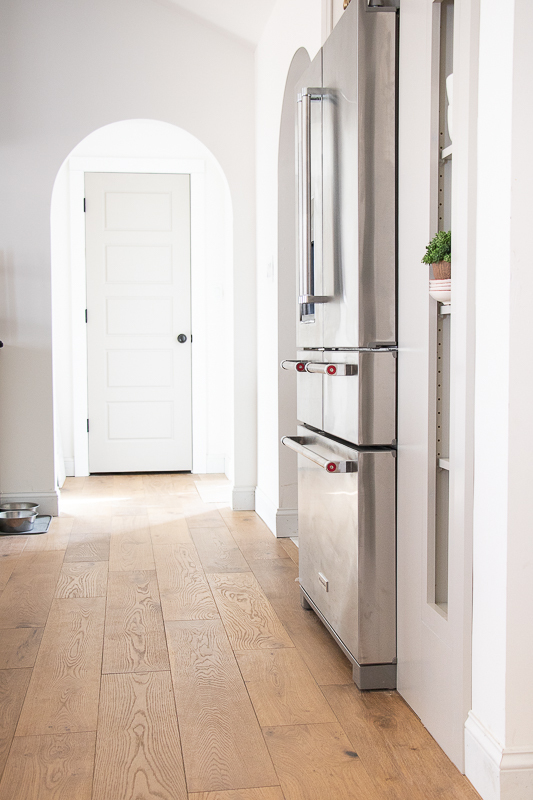 Something we always wanted in our last house and now having an open floor plan and a chef style kitchen will make for easier hosting. 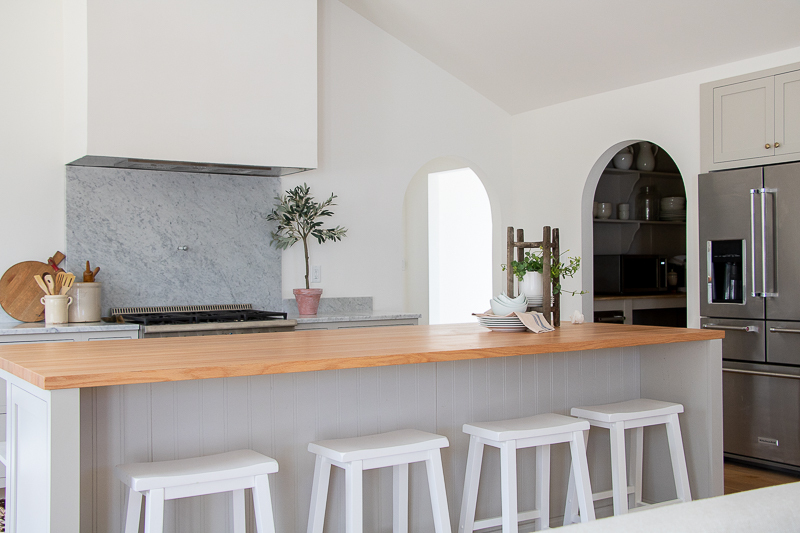 We now have more storage space in the refrigerator, a large oven and 6 burner stove, and an ice machine too for endless ice to host the perfect party and gatherings. We are so happy with our Kitchen aid appliances, Kutch range, and overall selection. 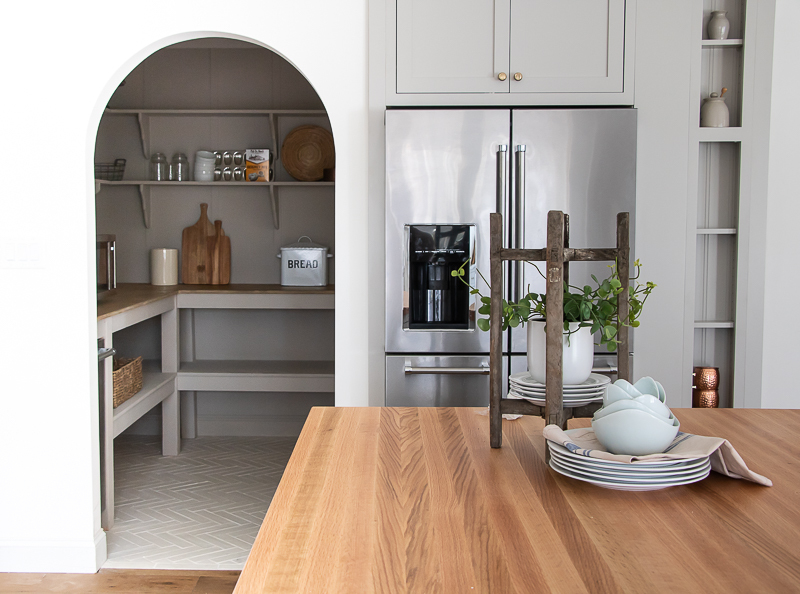 They work beautifully with the layout, style of the cabinets, and bring that chef style feel to the space. Working with Home Depot was so easy and they truly offered what I thought I would never be able to have in my home. I did not want something that felt too typical. The Kitchen Aid and Kutch brands are some of the best Home Depot offers and I think it goes to show be sure to check Home Depot’s website because that’s where I got to see more styles of the Kitchen Aid and came across the Kutch range that they did not have at my local store. I got some knowledge in store and then was able to finish selecting what I wanted online. It was a great experience and I look forward to enjoying my appliances for years to come. Beautiful kitchen! I love the floors and arched doorways, too. But you have a typo in the range name. It’s Kucht. I looked at them online at Home Depot and love the range you chose. That blue interior is amazing! Thanks for catching that Dori! Thanks for sharing! Can we talk about those windows??? GORGEOUS!!!!! Thank you so much Kim! I love them, I wanted something different and love the stained diamond pattern. I went with Kitchen Aid as well. I love the look of stainless. I picked the fridge with the filtered water inside. It actually gives you more space inside the fridge and prevents those splash lines. I saw that happen over & over again with my friend, so liked that option. I brought the double wall oven. It’s great when you want to cook two things at a different temperature. My dishwasher is a failure though, in that I have to dry some dishes on the top rack. It cleans well and is quiet, so that is my one beef. I love your double fridge and cool looking range. 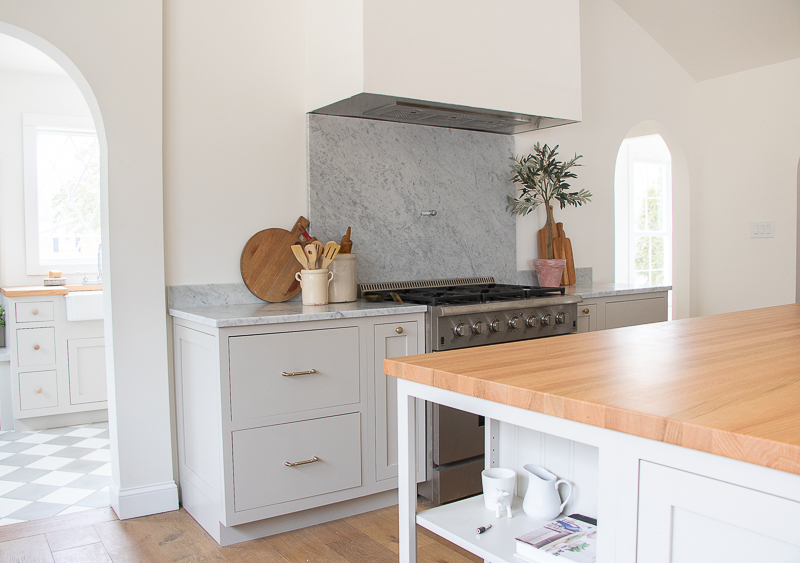 Isn’t it wonderful to cook in a pretty kitchen? Great design. Love the spacious, light, airy feeling. I especially like the open pantry look. Thank you so much! We are so thrilled with how it turned out. Oh My!! 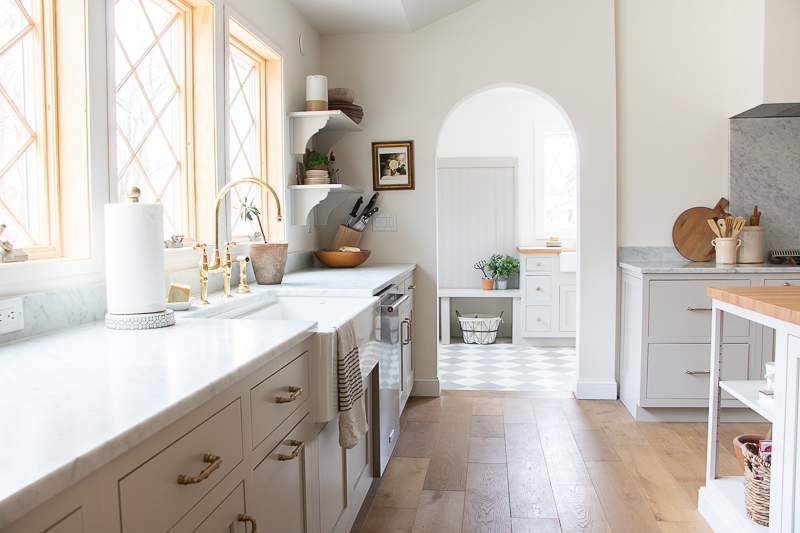 I love the tile backsplash! Your kitcheeen is so organized and so beautiful! I love it.